When you decide to paint the interior of your home, the biggest question you have to ask is: how much paint will you actually need? Oftentimes, the math has been done for you when you look at a bucket of paint. For example, you can grab a bucket of Regal Select that will state that it can cover anywhere from 400 to 450 square feet of interior space. That means it should in theory cover a room measuring perhaps 10 feet high by 40 feet around. However, there are different conditions that may require you to invest in extra paint. It’s important to take into consideration that your wall may be dry, therefore, your first layer of paint may get sucked right in. This is of course due in part to the fact that you won’t need to be using a primer for your walls as quality paints will already have it built right in. Most paints that you can purchase nowadays are water based with a primer, therefore, unless you’re a contractor, you can outright skip the priming. What does that mean for you? 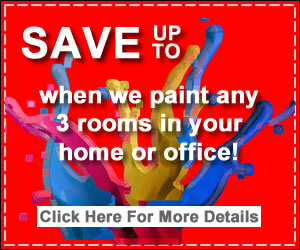 It ultimately means that one bucket of paint will not be able to cover your 400 plus square foot bedroom. For a medium to larger sized bedroom, it’s best to make room in your budget for two gallons of paint in a matte or eggshell finish. Moving on up from your walls, you will need to take your ceiling into consideration as well. Most homeowners, especially in apartments, will opt to paint the ceilings the same color as the walls. For a one-bedroom apartment, approximately three gallons of flat paint can do the trick. Instead of continuing with flat paint, your baseboards, trim, and doors will last much better when you use semi-gloss paint for the job. For finishing up these minor details, you can usually get it done with one gallon or less. There may be other areas of your home that you will need to take into consideration such as an entryway or hallway. Those spaces will not require as much paint as three gallons, therefore, you can easily get away with a one-gallon bucket of paint respectively depending on the actual area of the space. Some apartments and houses are blessed with ample dining room space, and if that’s the case with your property, you will need enough space for even coverage. Factor in using at least three gallons of paint that has the primer built in for your walls to start. Paint can be expensive and so are trips to the local hardware store. It’s important that before you go out and purchase the paint you need for your home improvement project, you know the number of gallons, colors, and the finishes you should purchase. This article is just a roundabout estimate what you will need to purchase for room, so if you wish to be entirely accurate calculate the surface area of your room and multiply it by the height of your ceiling.